Indulge Yourself at the Local Thermal Hot Springs. 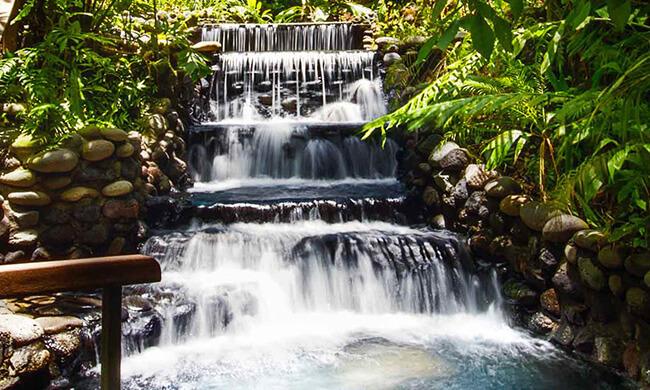 Eco Termales is the smallest of the Arenal area hot springs and accepts no more than 100 visitors at a time. Ecotermales is perfect for couples, families, and groups looking for a unique and authentic experience in a tranquil rainforest setting. The hot springs are owned by a local Costa Rican family, the Higaldos. There are four thermal hot spring pools in total varying in temperature with the coolest being 91º F and the hottest being 105º F. One of the pools has a waterfall that you can stand beneath! You will be picked up from your hotel and driven 20 minutes to the local Ecotermales where you spend two hours soaking in the mineral-enriched hot springs. Then enjoy a wonderful authentic and traditional Costa Rican meal at the Ecotermales restaurant. The restaurant used to be the Hidalgo family’s own house and still boasts colonial architecture. After your meal, you will be driven back to your hotel feeling refreshed and relaxed! What to bring: swimsuit, towel, change of clothes, extra cash for drinks, camera.